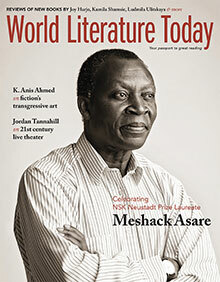 World Literature Today kicks off its 90th year of continuous publication with a stunning portrait cover of our 2015 NSK Laureate Meshack Asare—whose keynote address from our fall festival is put into sharp context by a moving tribute from Ghanian-born writer Nii Ayikwei Parkes. Valeria Luiselli takes on national identity, translation and the future of the Spanish language in an exclusive interview while Mai Al-Nakib wonders what is lost from conflating Arab literature with a literature of trauma and politics. Also featuring new fiction and poetry from Ireland, Germany, Korea, Finland and Italy as well as the editor’s picks, book reviews and web-exclusive content that makes every issue of WLT an essential read for the international reader.